Kyrie Irving got 30 points to go with five assists as the Celtics beat the Hawks for their 15th win in a row. Jaylen Brown added career-high 27 points on the night and played on a very efficient note just like Kyrie. These two have shot 20-for-25 combined, including 9-for-12 from downtown. Jayson Tatum chipped in with 14 points, seven boards, four steals, two blocks and two thunderous dunks as he dominated the third quarter. Marcus Morris finished the night with 14 points, hitting some big shots and providing much needed spark on the offensive end of the floor in the second quarter. 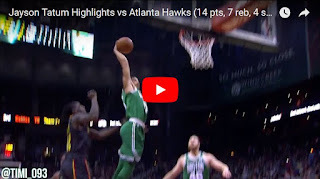 Marcus Smart had 10 points, four rebounds and two assists and Celtics defense made some nice highlights as Boston players got nine steals and six blocked shots on the night, once again keeping the opposing team under 100 points.